The chairman of soft drinks giant Coca-Cola has defended the firm's Olympic sponsorship in Beijing despite protests about China's role in Tibet. Neville Isdell told the BBC the firm supported the "credo of the Olympic movement", and agreed deals well before it knew where each Games would be held. The company, whose Olympic involvement dates back to 1928, was also a sponsor for the 1936 Games in Berlin. Mr Isdell said he would have agreed to that deal too, had he been in charge. "The sponsorship would have been committed four or five years ahead of that, and don't forget Neville Chamberlain was in Berlin on a very popular mission to talk to Hitler," he said. "Not everything was known in 1938 and the Olympics were in 1936." Coca-Cola's relationship with the Games began with the 1928 event in Amsterdam. Other big brands associated with the Games include Adidas, McDonald's, Kodak and VW. 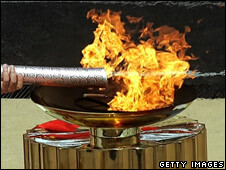 This year sponsors have had to deflect negative publicity after some of the international legs of the Olympic torch relay suffered violent protests over Chinese rule in Tibet. Reebok, which is owned by Adidas and is kitting out 250 Games participants, has decided against making its athletes available for press conferences or one-on-one interviews during the event. Mr Isdell said Coca-Cola sponsored each event before knowing where the Games would be held. "What we support is not actually individual governments but the whole aura that surrounds the Olympics and the credo of the Olympic movement," he said. Despite the widespread protests about China's stance on Tibet and its role in the crisis in Darfur, Coca-Cola did not reconsider its Olympic pact, he said. "What we are about is the broader context of what the Olympics brings to every country that it takes place in." Mr Isdell believes the Beijing Olympics will help China open up to the world and bring about change. "Look back in history, and you will see that China stagnated when it closed itself off to the world," he added. With one month to go, Mr Isdell said the company remained committed to China's Games and he aims to carry the symbolic torch on the opening day. "The Olympic torch was a symbol of peace. It was developed originally around the Greek Olympics to stop the warring that was going on between different factions in Greece at that time. "There are people who want it to communicate something different and are trying to use that symbolism for issues that may have a very fair resonance. But I don't believe it is right to use those symbols of peace for another cause." Mr Isdell said Coca-Cola's sponsorship strategy was based on moral principles. "I believe the Olympics are a force for good and if they were not a force for good, we would not sponsor them." The firm also rebuffs claims about the healthiness of its drinks, blaming a lack of exercise in the developed world for serious obesity problems. "It is about physical activity and if you look at the overall calorie intake around the world it has not increased in the developed world. What has happened is that the level of physical activity has decreased," Mr Isdell said. Coca-Cola argues that, as one of the world's biggest brands, public perception of its social and environmental credentials is often wrong. "We have 1,000 factories around the world," Mr Isdell said. "We are a local business with a very, very high level of local input - normally 85%. Therefore that minimises our carbon footprint." The company is tackling rising food costs and is also considering price rises to absorb the impact of higher commodity costs, such as corn syrup used in its drinks.